Why the Jal Dennis Group? How do you know the advice you receive is really in your best interest and not your advisor's? 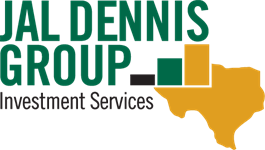 At the Jal Dennis Group, our clients are looking for a financial steward – an experienced advisor who will partner with them and serve as their advocate and guide on the path to pursuing their goals. Our focus is on long-term planning, not securities transactions. Our planning process is collaborative and requires your input every step of the way to ensure your goals and interests remain front and center. Personal finances aren’t simple. They are complex and oftentimes confusing. We simplify your finances by explaining them in a way that makes sense and leads to greater understanding. Through education and insight, you will be in a position to make well-informed decisions that support the pursuit of your goals.